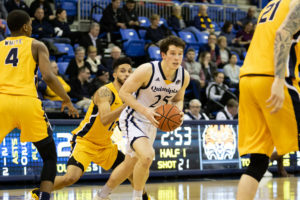 The Quinnipiac men’s basketball team was unable to pull out victorious in a close one, as graduate student guard Cam Young’s 3-pointer bounced out at the buzzer, sealing a 65-63 loss to Canisius. The Bobcats (8-8, 3-2 MAAC) led for just over seven minutes in this one, but kept it close in a game that saw 16 lead changes and 12 ties. Tied at 63 with 44.6 seconds remaining, the Bobcats turned the ball over, which led to a layup by sophomore forward Takal Molson with 5.6 seconds left to seal the win for the Golden Griffins (6-11, 3-2 MAAC). Quinnipiac got multiple big shots down the stretch, as a 3-pointer by senior guard Aaron Robinson gave the Bobcats a 58-57 lead with 2:33 to play. Senior forward Abdulai Bundu followed with an and-one layup to put the Bobcats ahead 63-61, but they were unable to hold the lead. The Bobcats were able to contain Metro Atlantic Athletic Conference (MAAC) Preseason Player of the Year Isaiah Reese to just 11 points, but he picked up nine assists and the game-tying bucket to help the Golden Griffins pick up their third conference win. Molson, the reigning MAAC Rookie of the Year, finished with a team-high 18 points for the Golden Griffins on a blistering 8-for-10 shooting. “[Molson] is just a physical player who gets a lot done near the basket,” Dunleavy said. The Bobcats struggled out of the gate in this one falling behind 9-2 and shot just 37.9 percent from the field for the game. Young led the way with 20 points on 9-of-17 shooting. Kelly chipped in 17, shooting 8-for-8 from the line, but just 3-for-10 from the field. “Usually I try to drive and find other guys and today they were denying a lot of the shooters,” Kelly said. Dunleavy said they didn’t necessarily play well, but that they kept themselves in the game to win, which shows his team’s character. The Bobcats will stay at home on Saturday as they take on Niagara at 2 p.m. at the People’s United Center.